There’s a lot of buzz around improved lifestyles and well being from those who focus on a Mediterranean diet. 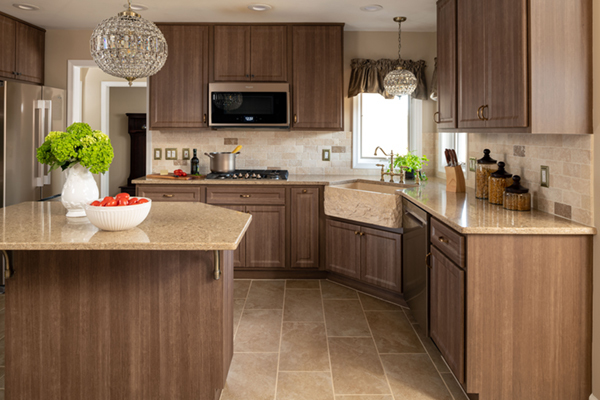 This family-oriented Hamilton, New Jersey household took that concept to the next level choosing a Mediterranean-inspired design for their kitchen transformation. The result is a stunning masterpiece of function and form—including glamorous accents (check out that light fixture over the sink and island!). The family gets to experience a bit of European luxury, every single day. Our Remodel of the Month for April will make you long for the old country and a visit to Europe. The act of surviving a kitchen remodel is not for the faint-o- heart, especially with a busy household. Thus, a timeless design and neutral palette ensure this is the last kitchen remodel they'll want for a good, long while. 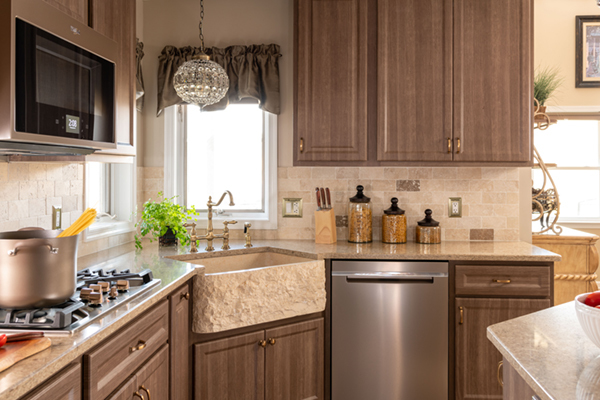 Choosing cabinet refacing did more than reduce the cost, it also cut the kitchen remodeling time frame down to about half. Is Low-Maintenance a Priority in Your Kitchen? As you can imagine, a household with younger kids means lots of snack and meal preparation—and that requires ample space. We designed their kitchen with a generous supply of perimeter counter space, along with a beautiful island. 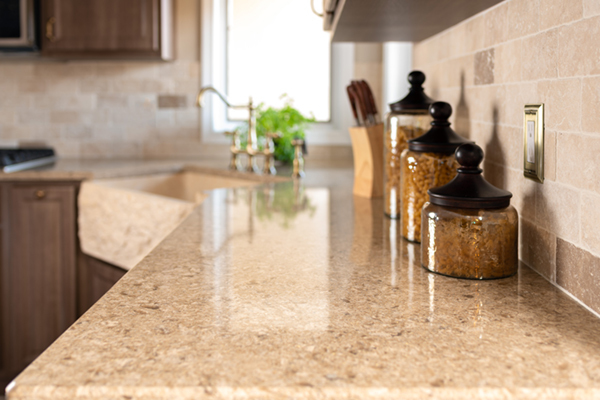 The homeowners selected Cambria quartz countertops in Linwood which has zero-maintenance as an added benefit. Notice the unique shape of the island. 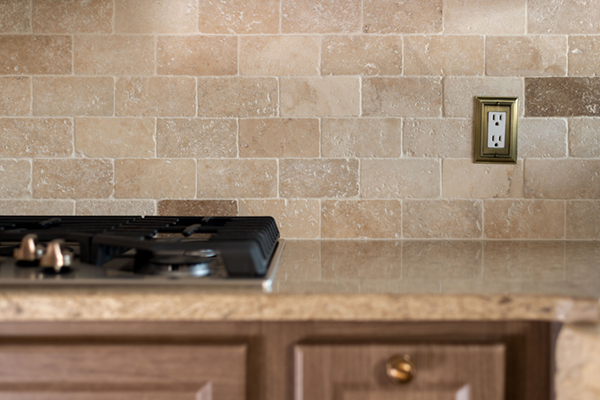 Layout customization is a major perk of quartz—which can be uniquely fabricated without the risk of chips, fissures or breakage that are potentials for natural stone slabs. Food, family, camaraderie and celebration are staples of European culture. Designing an open concept kitchen allows for plenty of space (with streamlined flow) to prepare food, enjoy the dining experience and hang out together. Comfort foods make you feel right at home even when you’re not. 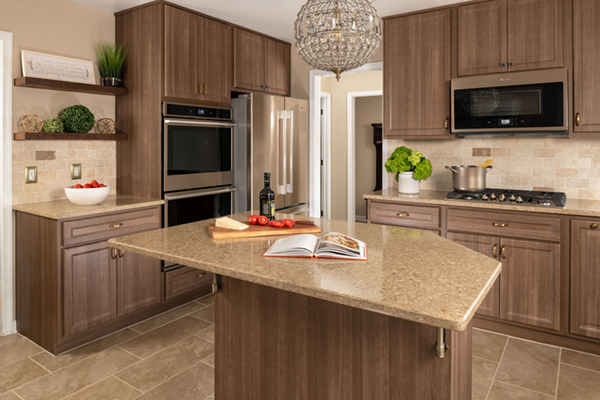 Likewise, the warm aesthetic and natural elements of this remodel create a welcoming and down-to-Earth vibe just like being in Europe without ever leaving your kitchen. Here the versatile flat-panel Prestige Square (a nod to Shaker style) are finished in Talas Cherry. A medley of gray and cocoa hues that highlight the beautiful wood grains. The plank-styled flooring is actually 20" x 7" ceramic tile, that mimics an Italian villa—adding to the old-world appeal and charm. The floor’s earth tones are repeated in the rustic ceramic backsplash. The nature-inspired colors include creams, clay tones and brown hues that reflect the Tuscan countryside. 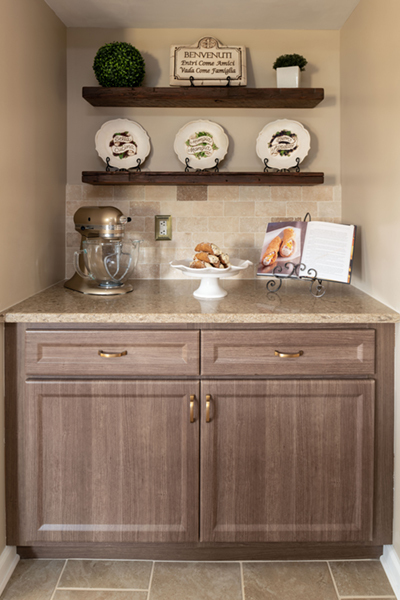 Customized perimeter and island cabinet storage means the ability to maintain a more clutter-free countertop expanse. It also makes way for open shelving space—a feature in just about every historic European kitchen on the planet. Open shelves are accessible, break-up larger, visual cabinet square-footage and allow the addition of seasonal patterns and colors based on what they display. Notice how this kitchen's open shelves are made with rougher, "reclaimed-esque" lumber for a rustic feel— and that the recessed niche is walled-in on both sides to protect breakable display items from ‘active children’. One of the most functional elements in your kitchen remodel just might be the new farmhouse sink. This pastoral farmhouse sink screams classic European style with ample texture thrown in. We're fans! It’s expansive size and deep bowl makes it stand up to any cleaning task. The raw stone finish and natural coloring adds another layer of texture to the design. 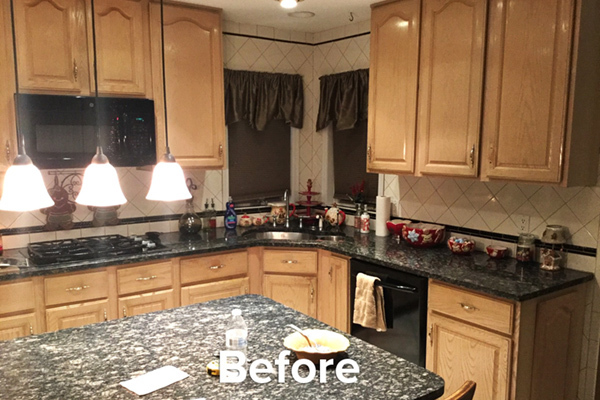 “We would like to express our sincerest gratitude for making our kitchen remodel so simple and quick! From the moment I sat down with the sales representative, I never once felt pressured or rushed to make any decisions that were final right away. Chuck was extremely helpful with suggestions, ideas and color schemes for the backsplash, countertops and cabinets. From the time the remodel began, all the craftsmen were extremely friendly, professional, respectful and clean. Even when they left every day, the work area was organized and tidied up. We appreciated that we had an organized project manager to answer any questions we had daily—even after hours. Most of all, what impressed us, and will make us share our experience with family and friends, was the integrity of this family owned company! After the remodel had finished and I had already signed off and did the walk-through, we took some photos and sent it to some of the guys so they could see their work. Noticing that one of the cabinets was installed wrong, they called to say they would be back to fix it. I never even noticed it, as it was such a slight issue. I was so blown away that they would reach out to me to tell me that they noticed something wrong and would like to come and correct it. What an incredible team! No matter what the vision for your new kitchen, the possibilities are simply endless. 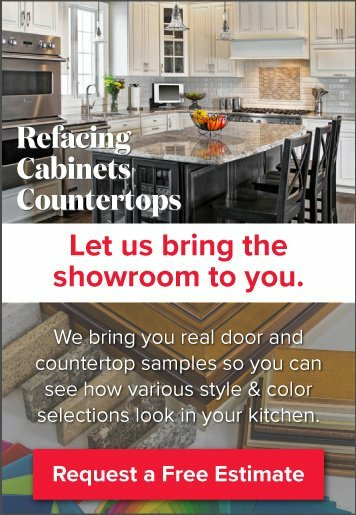 Whether you desire—a classically modern design, old-world rustic, or even Boho chic, we can take your kitchen from outdated to outstanding. 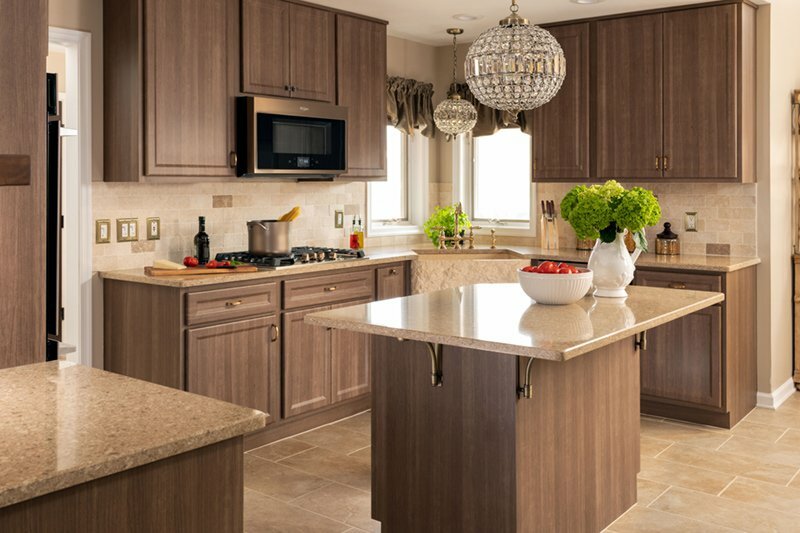 Ready to design your luxurious, European-inspired kitchen? Contact the Kitchen Magic design team. We specialize in budget-friendly kitchen transformations. A convenient in-home consultation & estimate can be scheduled online today! Simply click or call (800) 272-5490.